The transitional features to be described in this section are ice-disrupted bedrock features straddling the edges of hills or ridges. Accordingly, transitional features cross the boundary area where bedrock slope adjusts from a level grade to a more steeply inclined terrain. 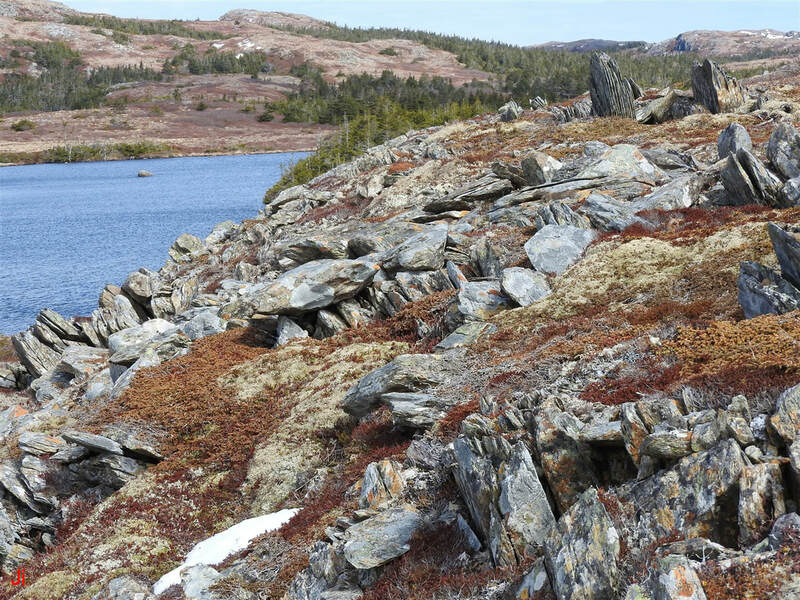 The characteristics of ice-disrupted bedrock often change markedly when ground slope changes. 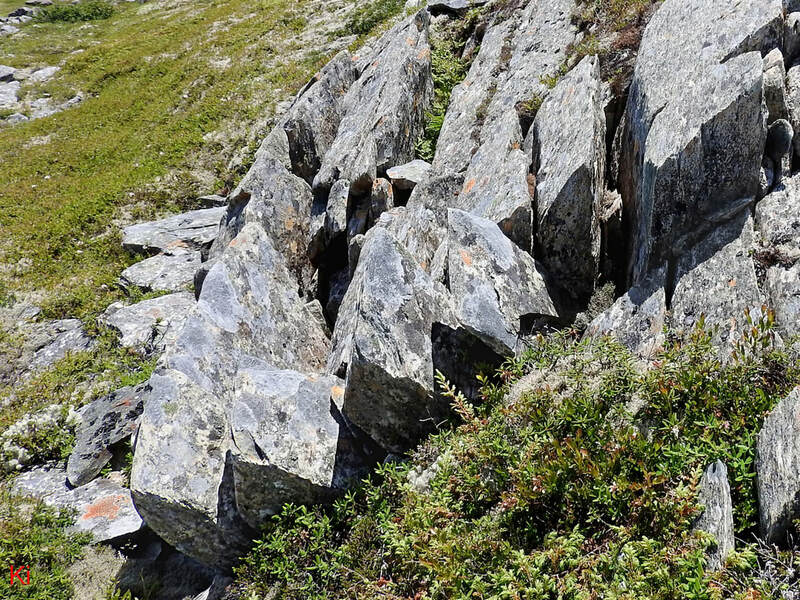 The origin of ice-disrupted bedrock occurrences on sloping surfaces can be better understood by linking the occurrences to adjacent bedrock frost-heave features seen on level ground. 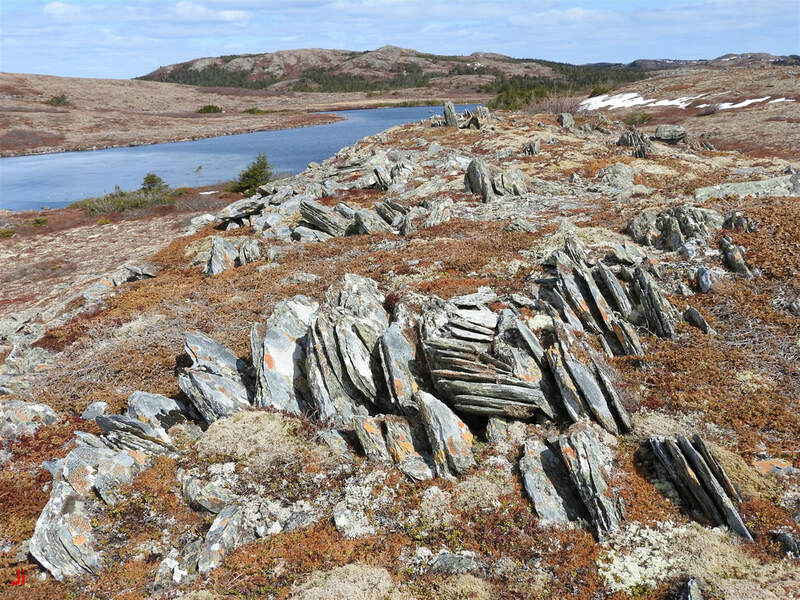 Ice-disrupted bedrock features occurring on level terrain (for example, frost-heaved bedrock monoliths) presumably originated in a subfreezing (cold) environment. This cold environment could be either subaerial or subglacial. Ice-disrupted bedrock occurring on sloping ground might have originated in either one of two distinct thermal environments. Fracturing and shifting of rock could be caused by plucking during warm-based glacial ice flow (the typical interpretation in most parts of the world) or else it might be caused by low-temperature frost-heave processes analogous to those that generate frost-heaved monoliths on level terrain (a less common explanation). 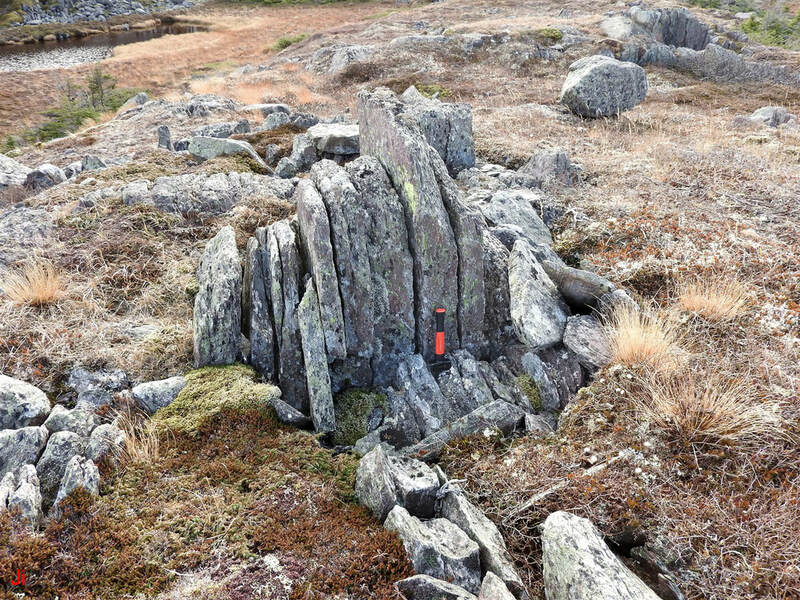 Frost-heaved monoliths of apparent subglacial origin are abundant over large areas on the Avalon Peninsula of Newfoundland, and these monoliths are frequently found in close proximity to ice-disrupted bedrock slopes. The resulting transitional features provide a basis for inferring the likelihood of a shared environment of origin for frost-heaved bedrock monoliths on level ground and rotated frost-heaved joint blocks on adjacent sloping terrain. 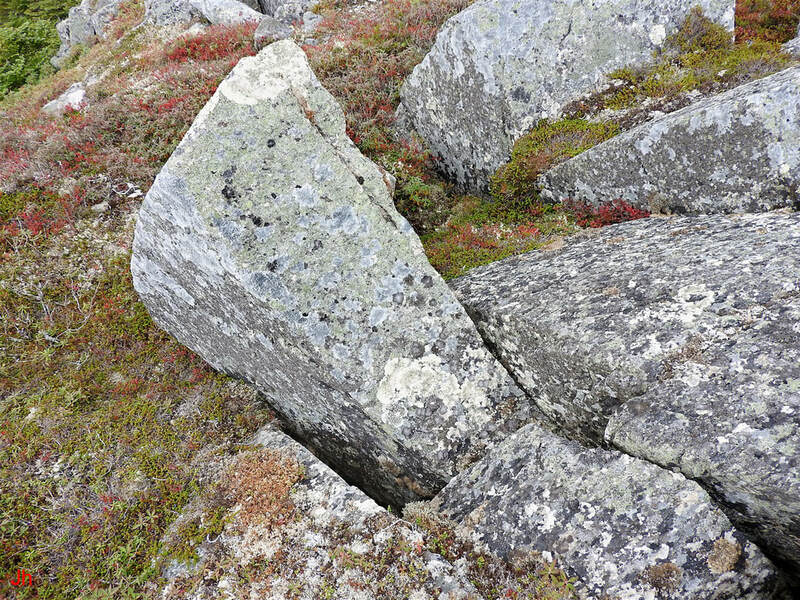 It will be argued below that in many cases, frost-heaved bedrock monoliths seen on level ground and rotated frost-heaved joint blocks seen on sloping ground are the consequence of similar underlying processes. Given that this argument is valid, there remain three key differences in the circumstances controlling the two related occurrences. 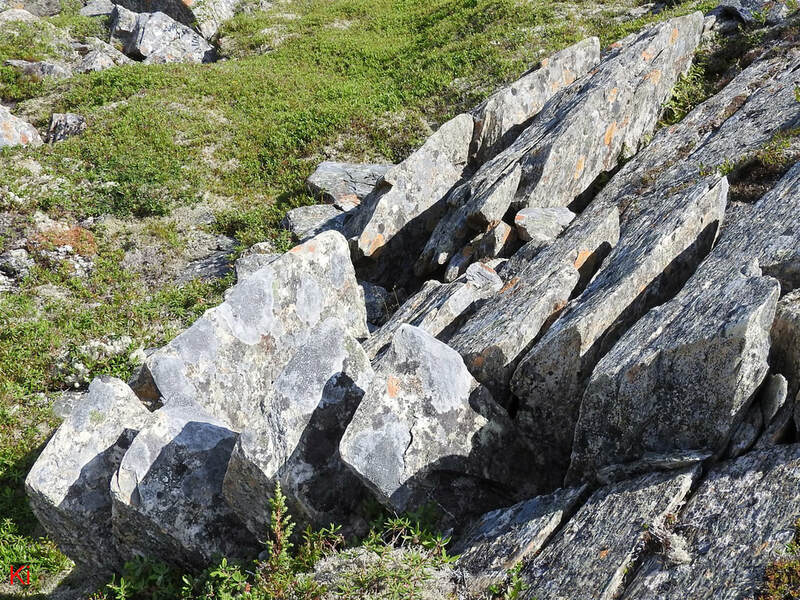 These circumstances, acting alone or in combination, can lead to ice-disrupted bedrock features on sloping surfaces that differ significantly in form and size from the ice-disrupted bedrock features typically seen on level or low-sloping terrain. 1) Ice pressure. The pressure (primarily hydrostatic pressure) attributable to overlying glacial ice can be substantially diminished on slopes that descend along the forward ice path of a cold-based glacier. Reduced ice pressure can accelerate hydraulic action driving groundwater toward sites of ice segregation and thereby accelerate the resulting bedrock disruption. 2) Rock confinement. 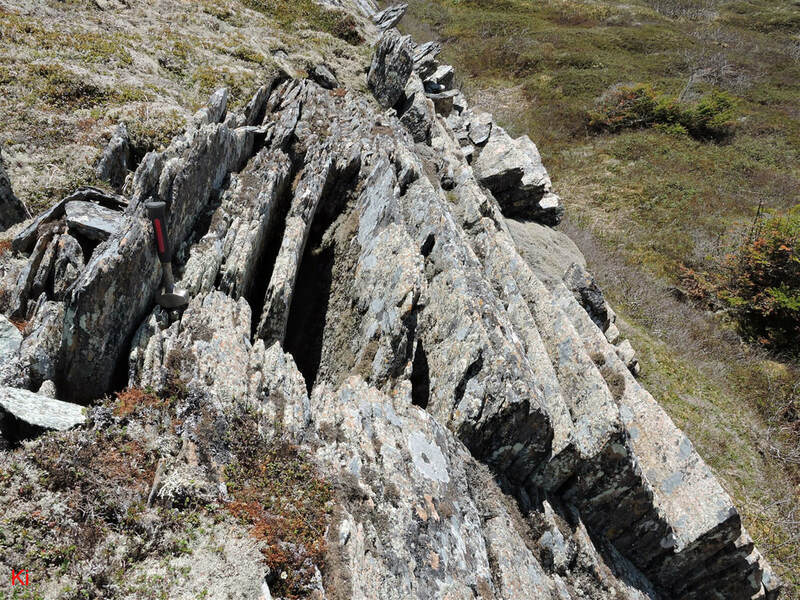 When foliation dips at a near-vertical angle (the usual case) joint blocks on sloping surfaces experience less confinement by adjacent rock than equivalent joint blocks embedded in non-sloping bedrock. Unlike frost-heaved monoliths set in level bedrock, joint blocks on sloping surfaces are not restricted with respect to certain rotations (see diagrams in Bedrock frost heave with rotation : Introduction). 3) Infill by ambient ice. The gap beneath a frost-heaved monolith moving vertically upward from level bedrock must be filled entirely by segregated ice and the accompanying heat of crystallization must be removed. Ambient glacial ice moving via creep can fill gaps left by joint blocks rotating outward from a sloping surface. Minimal heat transfer is needed when filling gaps with ambient ice. Any process that involves shifting bedrock and filling the resultant gaps with ambient glacial ice is not strictly a frost-heave process. However, the subglacial rotation of blocks directed outward from a slope can comprise a hybrid process with segregated ice initiating and augmenting block displacement even in cases where infill by ambient glacial ice eventually dominates the overall pattern of bedrock disruption. There is no simple way to unambiguously differentiate between purely warm-based glacial plucking features and hybrid features representing a combination of frost-heave activity, cold-based glacial flow and possibly, warm-based glacial plucking that preceded the onset of cold-based glaciation. Some potential methods of making the distinction have been discussed in Bedrock frost heave with rotation: Introduction. The examples below provide another approach toward identifying features that possess an important frost-heave or cold-based glaciation component and distinguishing these hybrid occurrences from features formed exclusively by warm-based glacial plucking. 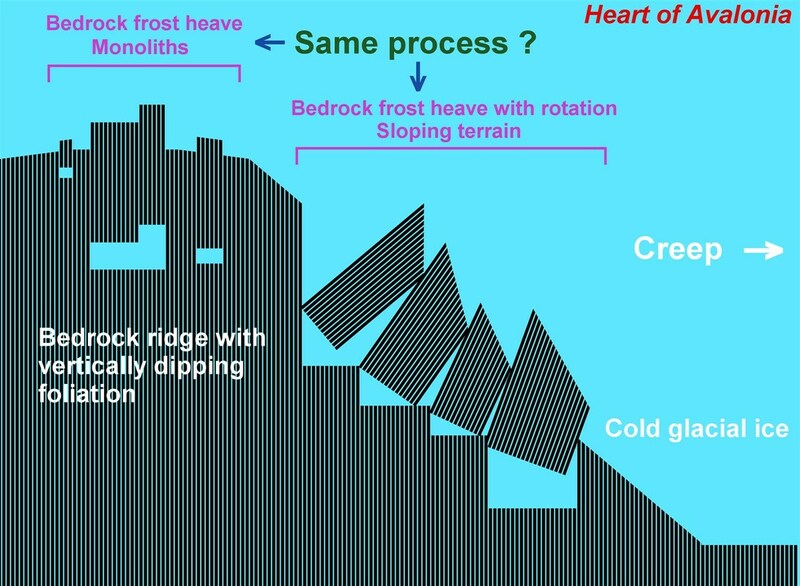 The above diagram summarizes the preceding discussion regarding frost-heaved monoliths on a level surface and adjacent rotated frost heaved joint blocks on a sloping surface. The diagram assumes the presence of overlying cold-based glacial ice that potentially undergoes creep towards the right. Any movement of ambient ice would contribute to the rotation of the blocks on the sloping surface. 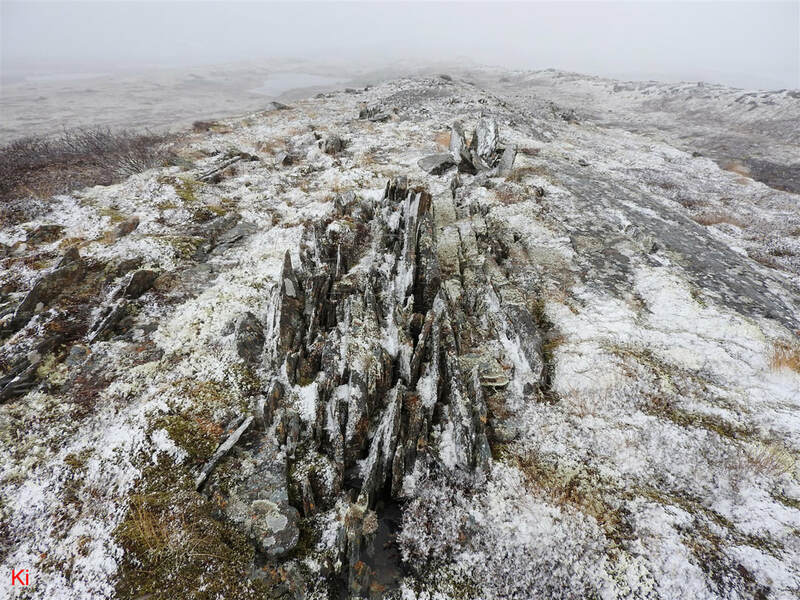 The rotated blocks, as well as the blocks at the top of the ridge, are subjected to vertically-directed frost heave stemming from upward migration of pore water and the crystallization of this pore water to form accumulations of segregated ice. The overall motion of the blocks is controlled by the vector sum of tangential and non-tangential ice creep and by the degree of confinement by adjacent rock. Five examples of bedrock frost heave occurring near a transition from a low-sloping surface to a more steeply sloping surface are provided below. The examples imply that the same initiating process underlies bedrock disruption by ice in the two different slope environments. The ice-disrupted bedrock feature shown above includes vertically frost-heaved bedrock monoliths (upper right) transitioning to rotated frost-heaved joint blocks (lower left). The photos below show four views of the rotated joint blocks taken from different angles. 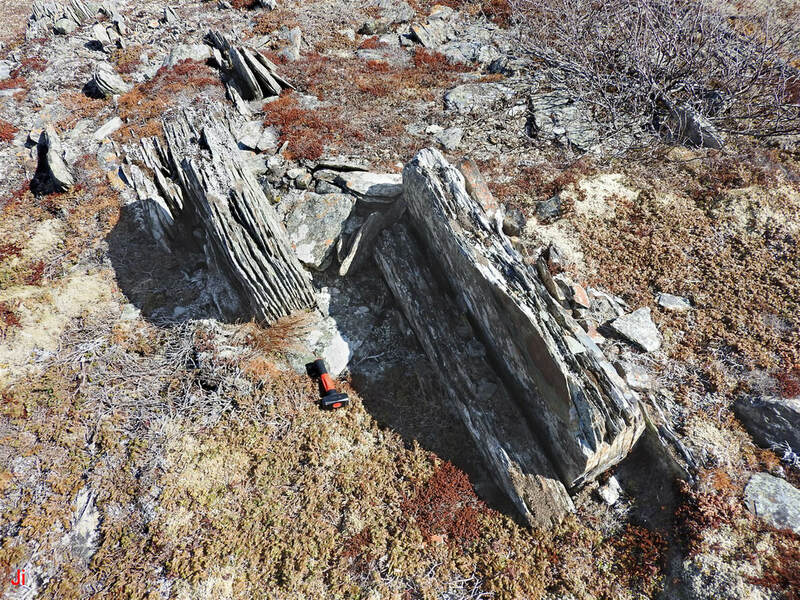 The above photos make it clear that the blocks at the bottom of the feature are primarily rotated, not simply translated outward in the direction normal to the surface of the glacially-smoothed bedrock ridge. The last (bottom) photo in the group shows leftward-facing edges visible on the three lower-most blocks. 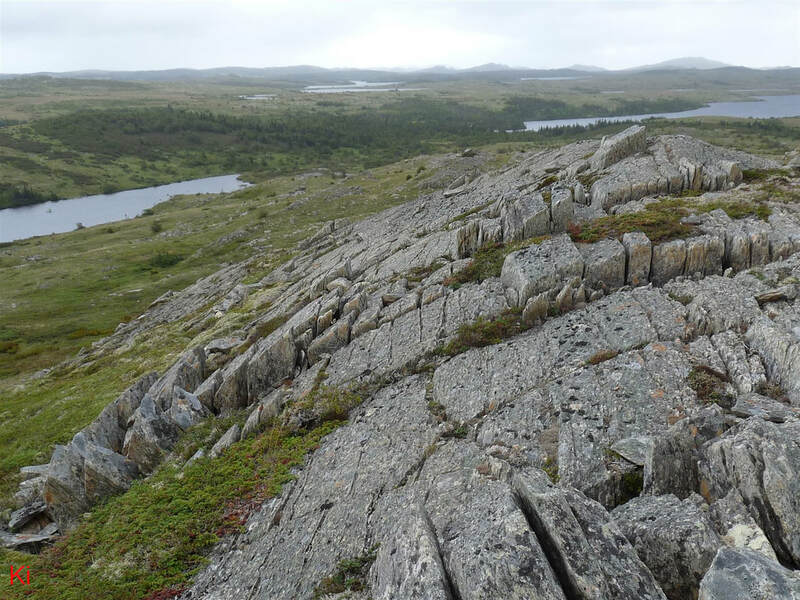 These edges conform to the initial glacially-smoothed surface of the ridge and their tilt relative to the ridge surface indicates the degree of rotation of the blocks. The photo below shows the contrasting vertically frost-heaved blocks at the top of the ridge. The frost-heaved blocks seen in the above photo were shifted by translation and show no significant evidence of rotation. The above-described Transitional feature 1 forms part of Illustrative Feature 08 (pending). Analysis of the local area suggests that bedrock frost heave at the site was subglacial in origin, but that there was little tangential movement of glacial ice during or after the occurrence of frost heave. Bedrock shifts were mostly caused by non-tangential ice motion (subglacial frost heave). The rotation of the blocks at the base of the transitional feature was the result of lack of confinement by surrounding rock. The lack of confinement favored rotation when ice accumulated in joints beneath and beside the blocks. 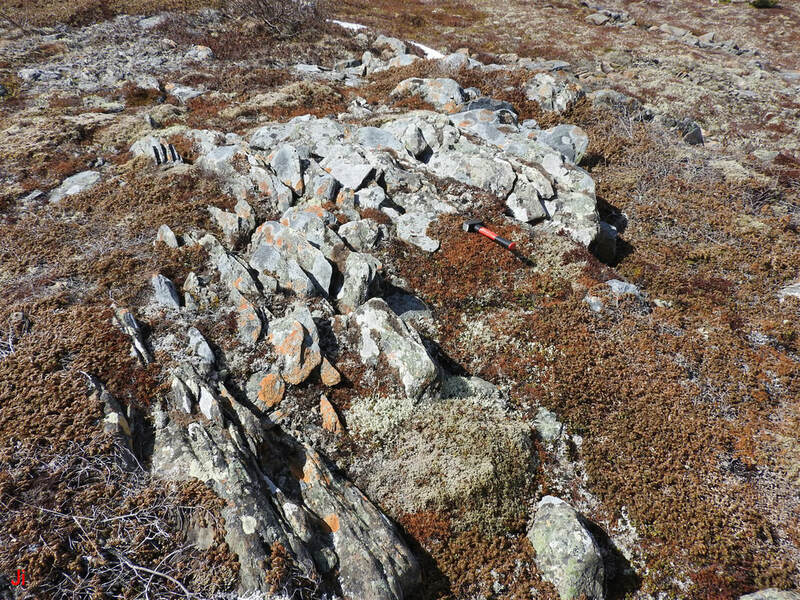 The above-illustrated example includes vertically-oriented frost-heaved bedrock monoliths seen at the upper right of the photo and in the foreground along with frost-heaved, rotated and dislodged joint blocks seen in the down-slope area. A closeup view of the group of monoliths appearing upper right in the above photo is shown below. The blocks shown above were shifted in vertical translation with no rotation. Two views of the ice-disrupted bedrock occurring on the lower, sloping portion of the ridge are shown below. The ice-disrupted bedrock shown above was shifted upward by frost heave and rotated top-outward, away from the ridge. 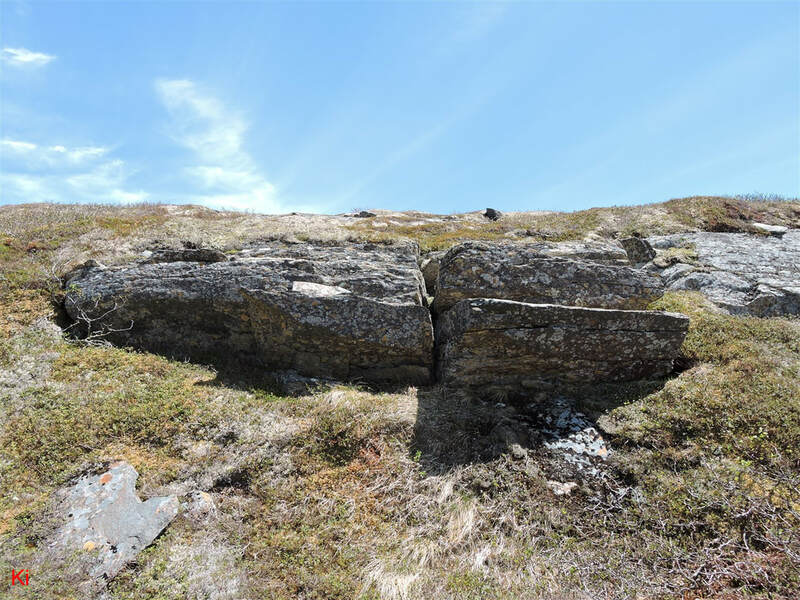 The first (left) photo above shows joint blocks that have been dislodged from substrate and carried down-hill, presumably by tangential glacial ice motion. Close observation of the current positions of the dislodged blocks minimizes the likelihood that their present arrangement is solely the result of the blocks settling (tipping over) or sliding down the slope. Transitional feature 2 appears to be an example of subglacial bedrock frost heave accompanied by a limited amount of down-slope glacial ice creep. The transitional feature shown above is formed in regionally metamorphosed, metasomatized volcanic rock (tuff and ignimbrite). The host bedrock is mildly schistose and is foliated in alignment with longitudinal tectonic stress. The foliation is visible in the above photo. 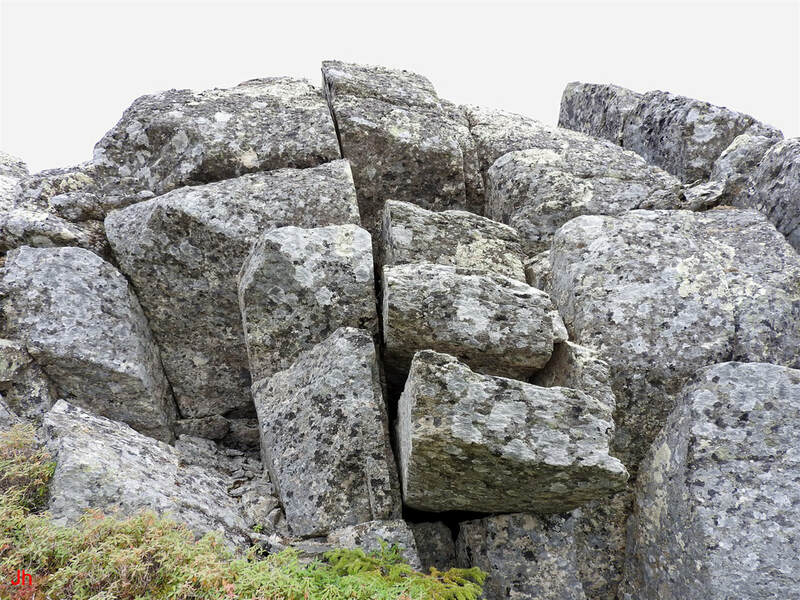 In addition to foliation and associated longitudinal jointing, the bedrock incorporates a well-developed system of cross joints. Some of these cross joints (and associated ice-widened fissures) are exposed and visible along stretches extending uninterrupted for tens of meters. 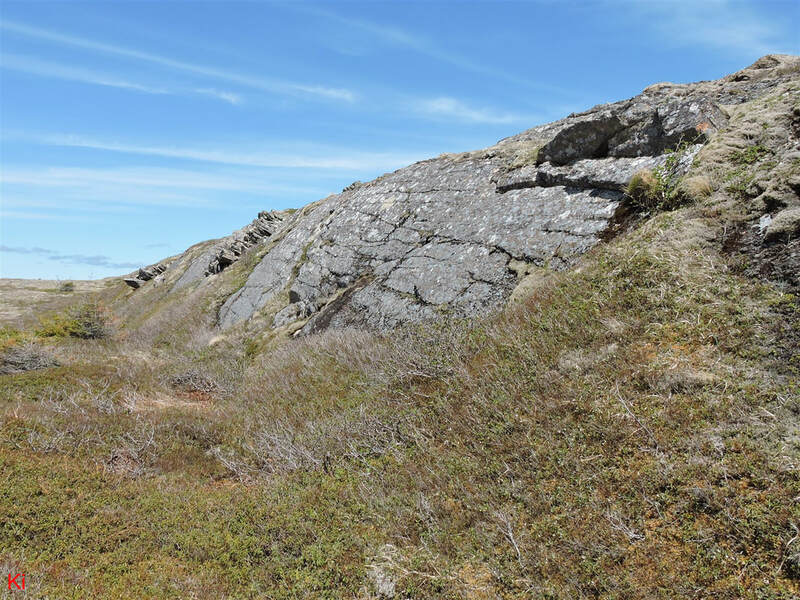 The above photo shows the south-west corner of a ridge that extends more than 1 km in length and rises 30-60 meters above the adjacent terrain on both sides. Glacial ice flow across the ridge (just preceding final deglaciation) occurred in a southwesterly direction. 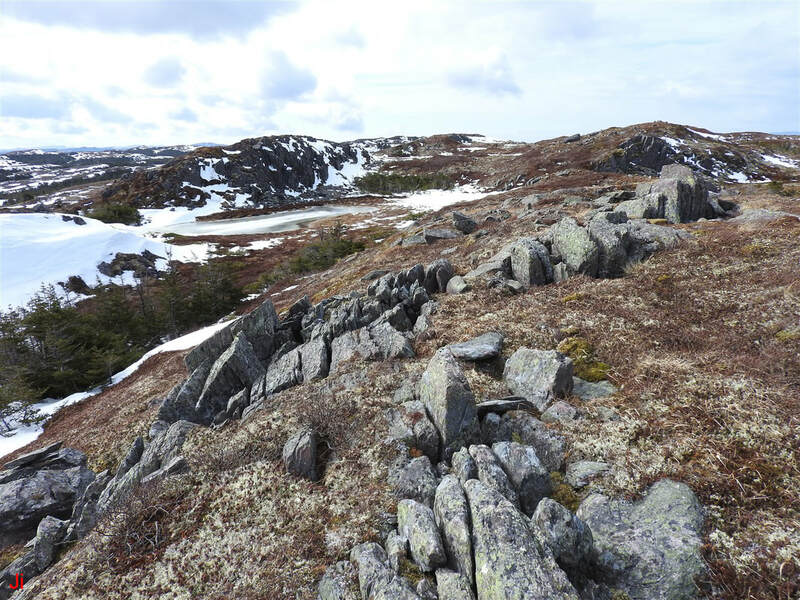 The ridge includes abundant evidence of both warm-based and then cold-based glacial activity along with extensive bedrock frost-heave activity. 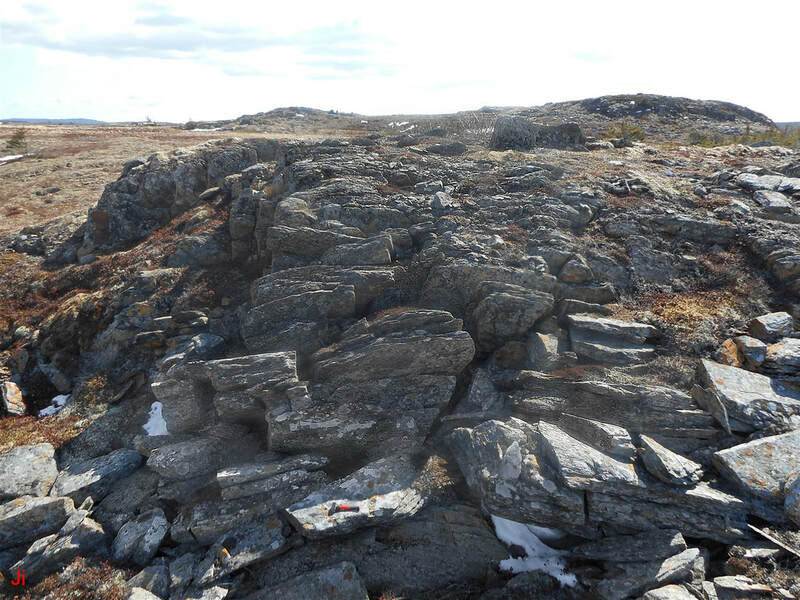 Two large frost-heaved bedrock monoliths are shown in the above photo. These blocks are visible in the lower left quarter of the frame (wedge-shaped block protruding outward at an inclined angle) and just above and to the left of center of the frame (roughly rectangular block with dark facing surface). 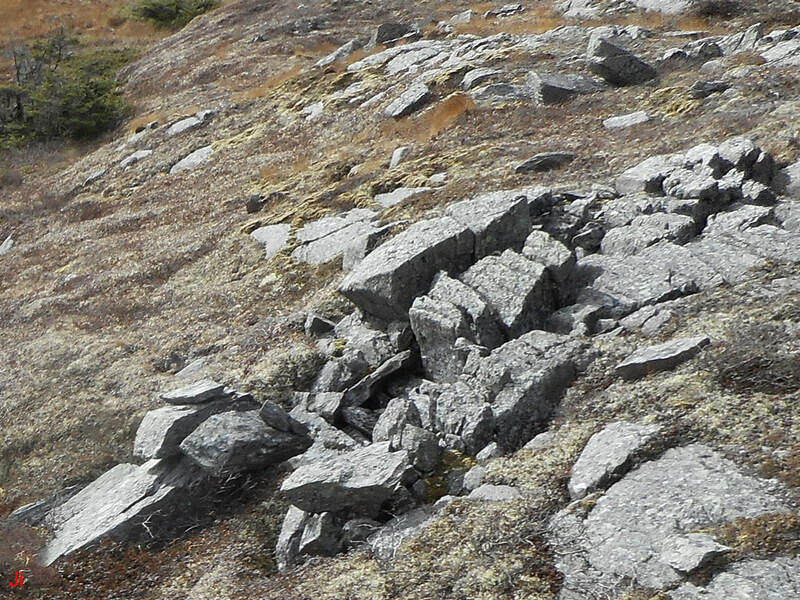 The photo also shows a substantial area of frost-heaved bedrock with rotation (right of center, steeply sloping). A closeup of the wedge-shaped frost-heaved monolith is shown below. 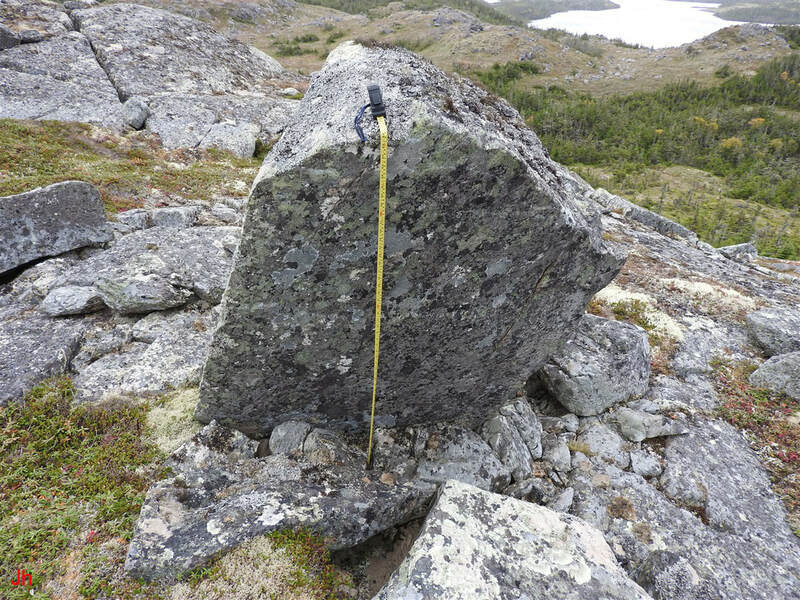 The frost-heaved monolith shown above (note hammer, 27 cm long, for scale) extends outward from bedrock at an unusual, highly inclined angle. The block points roughly down-ice at this location, and its orientation may reflect alignment by glacial ice creep. Two more photos of the block are shown below. The second (right) photo above shows the base of the wedge-shaped frost-heaved joint block. This block was almost completely dislodged from bedrock substrate. The small joint block behind the wedge-shaped block was shifted down-ice to occupy space vacated by the larger adjacent block. A large frost-heaved monolith is shown above (seen also in wide-angle photo at beginning of this Transitional feature 3 discussion). In addition, a smaller monolith is visible at the center right of the above frame. The size of the large monolith is illustrated in the following photo. The tape seen above reads 1.4 m at the point where it bends. The large size of the frost-heaved block is indicative of the severe frost heave conditions that affected this site. 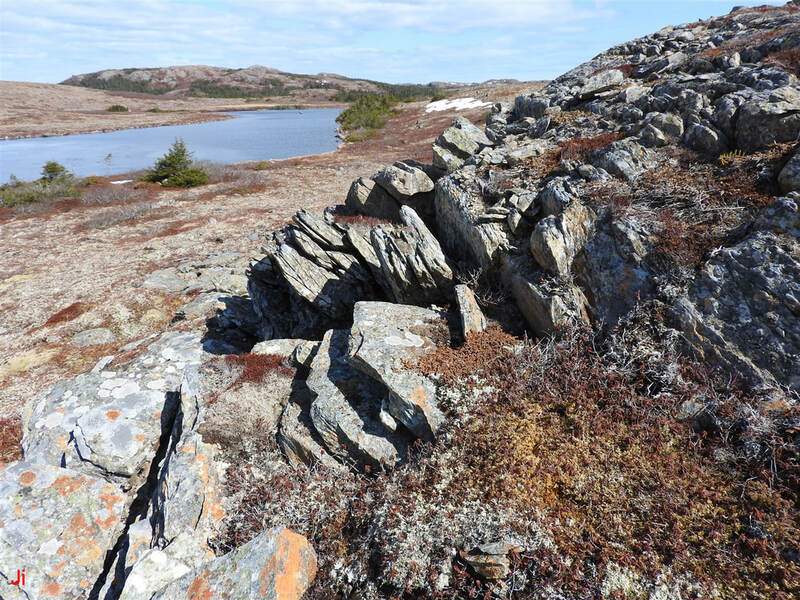 Many other severe and extended ice-disrupted bedrock features are present in the surrounding area. The probable commonality of origin of the major ice-disrupted bedrock components of Transitional feature 3 is illustrated in the above photo. The corner of the ridge appears thoroughly disrupted by the intrusion of pressurized ice that accumulated in bedrock joints. Without the large vertically-displaced monolith seen near the top of the outcrop, it might be assumed that tangentially-moving glacial ice was solely responsible for the bedrock disruption. The vertically-directed shift of the large block indicates that ice pressure from within the ridge augmented external glacial ice pressure to yield the overall pattern of rock displacement. It seems reasonable to deduce that internal pore-water pressure and ice segregation could have dominated external ice flow at this location and thereby accounted for most of the rock displacement observed in Transitional feature 3. 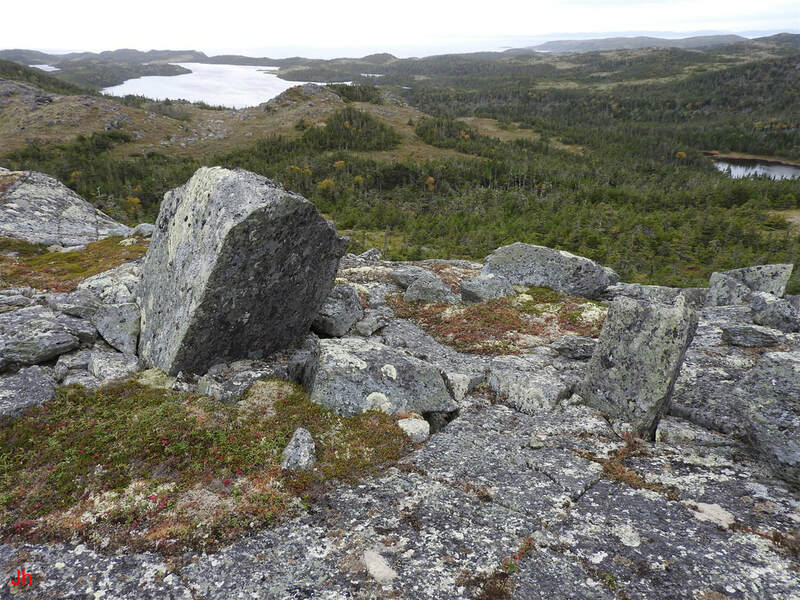 No significant volume of bedrock appears to have been removed from the sloping surface of the ridge by glacial transport. The original steeply inclined surface, rounded and smoothed by a prior episode of basal-slip glacial erosion is still recognizable. 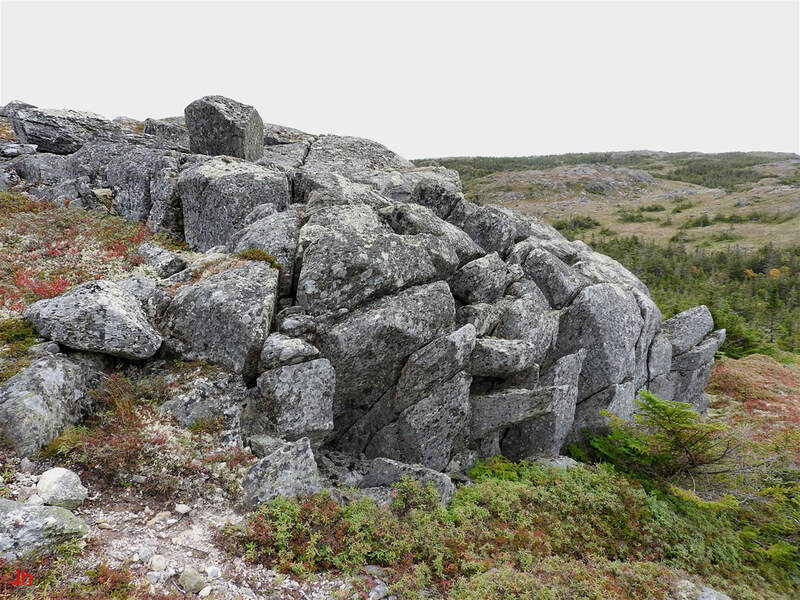 The above view shows rotated joint blocks on the side of the ridge just below the large frost heaved bedrock monolith discussed above (view of monolith is obstructed in the photo). 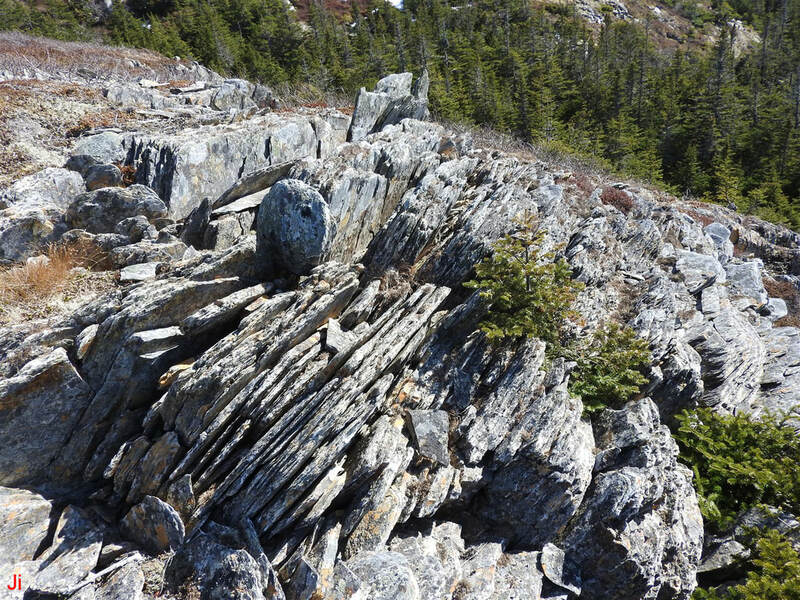 Rotation of the blocks was favored by the vertically dipping foliation in the host bedrock and the lack of confinement of the blocks exposed along the steeply sloping external surface of the ridge. 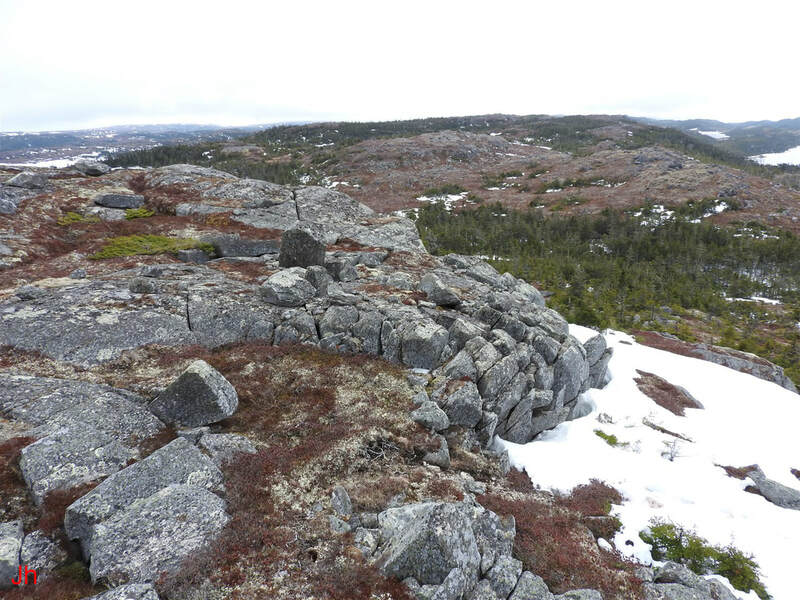 Transitional feature 3 is of particular significance because the ridge hosting this feature includes some of the largest frost-heaved bedrock monoliths found on the Avalon Peninsula, along with numerous large-scale rotated frost-heaved bedrock features occurring on steeply sloping terrain. Analyzing the connections between the varied ice-disrupted bedrock features on this severely frost-heave affected ridge will potentially aid in understanding the subglacial ice/rock interactions that took place while the Isthmus of Avalon deglaciated under cold climate conditions. 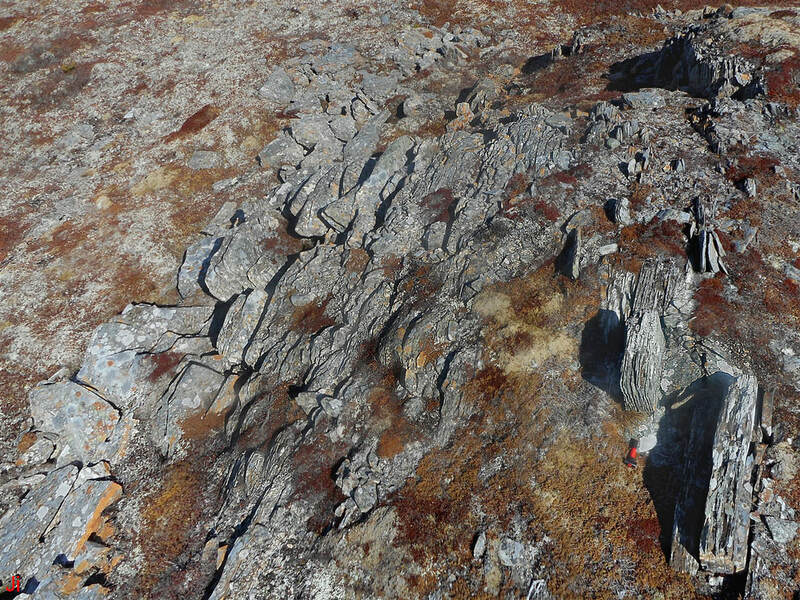 The above photo shows the end of a small bedrock ridge with abundant indication of disruption by ice. 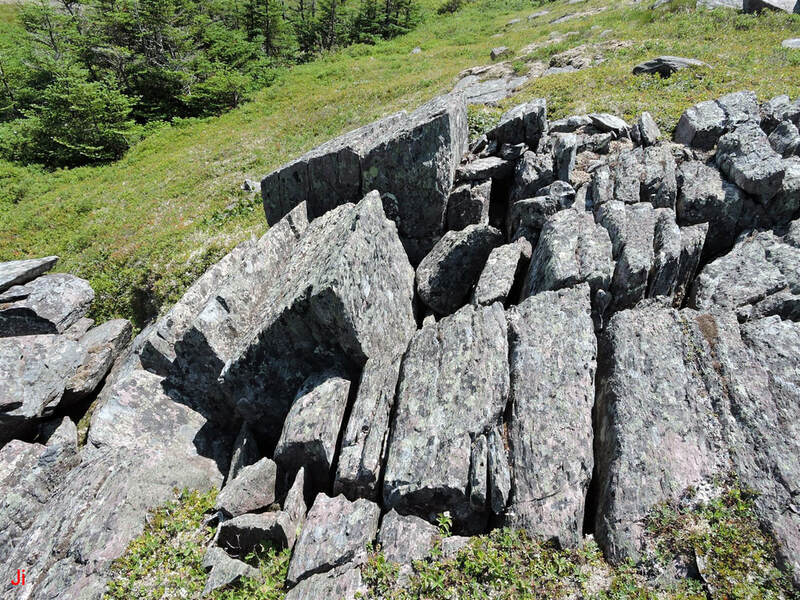 Numerous instances of frost-heaved bedrock (vertical monoliths) are found along the top of the ridge. Lower down, on the sloping portion of the ridge, bedrock has been shifted mainly by rotation. Two substantial frost-heaved monoliths can be seen at the lower right of the upper left quadrant of the frame. A closeup view of these monoliths is shown below. 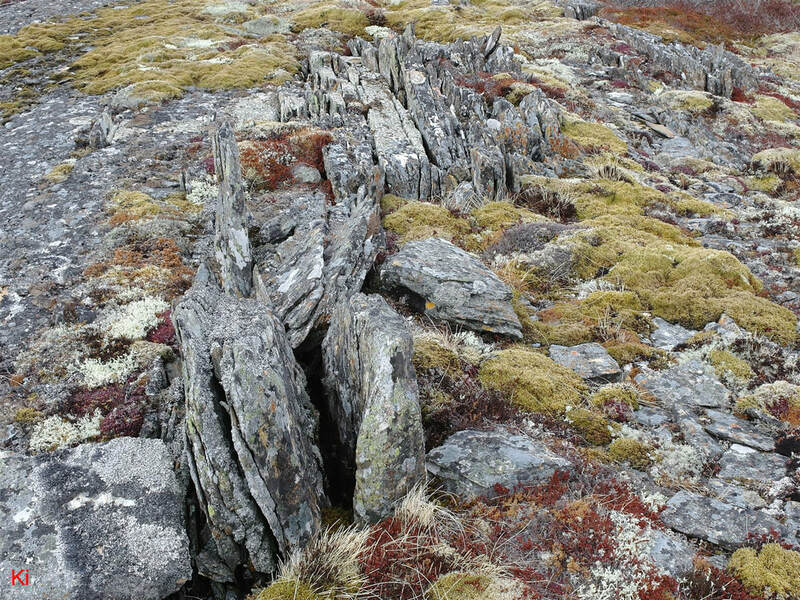 The monoliths illustrated above show signs of enhanced foliation or joint widening, a potential consequence of accelerated erosion (Holocene freeze-thaw weathering) following pre-Holocene entry of pore water into the rock under pressure and accompanying ice segregation during subfreezing, subglacial conditions. The basis for this analysis will be discussed in more detail in Joint Widening and Fissure Development (pending). The block appearing above and to the left of the hammer is shown in more detail below. 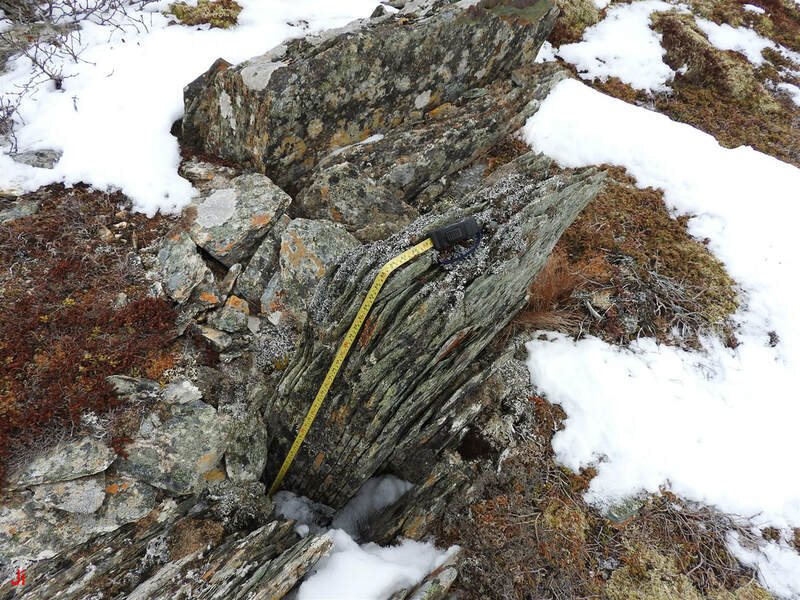 The tape appearing in the above photo extends down about 70 cm from the top of the block to reach ground level and then an additional 70 cm before reaching hardened snow at the base of the adjacent fissure. The frost-heaved joint block is at least 1.4 m long, top to bottom. 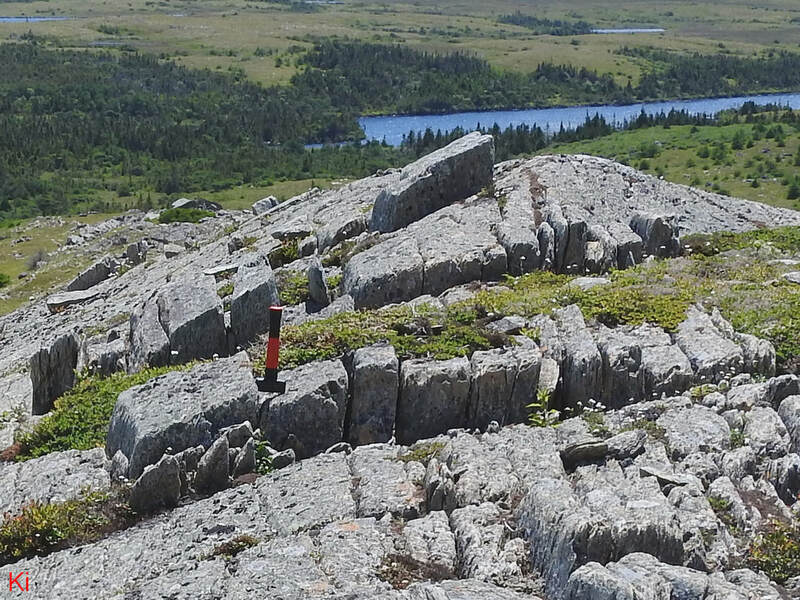 Other instances of frost-heaved bedrock monoliths, including bedrock frost heave with rotation on level terrain, are shown in the following photo taken along the top of the ridge. 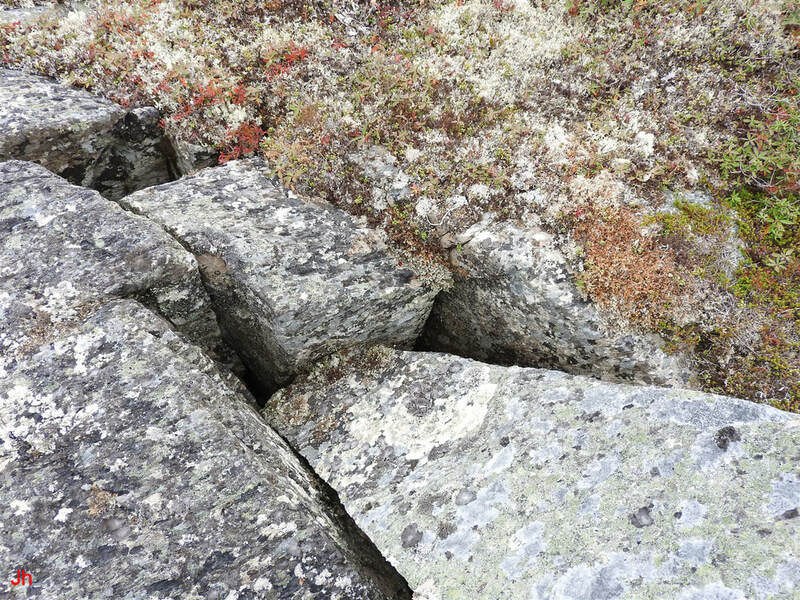 The above photo shows a consistent pattern in joint block rotation, suggesting tangential glacial ice movement (right to left as seen in picture) across the site. The photo below shows a small flow feature (flow feature defined as in Bedrock frost heave with rotation: Part 2 - Flow features). The flow feature illustrated above indicates that glacial ice cover and glacial ice creep affected the site of Transitional feature 4 in association with the bedrock frost heave that took place on top of the ridge. 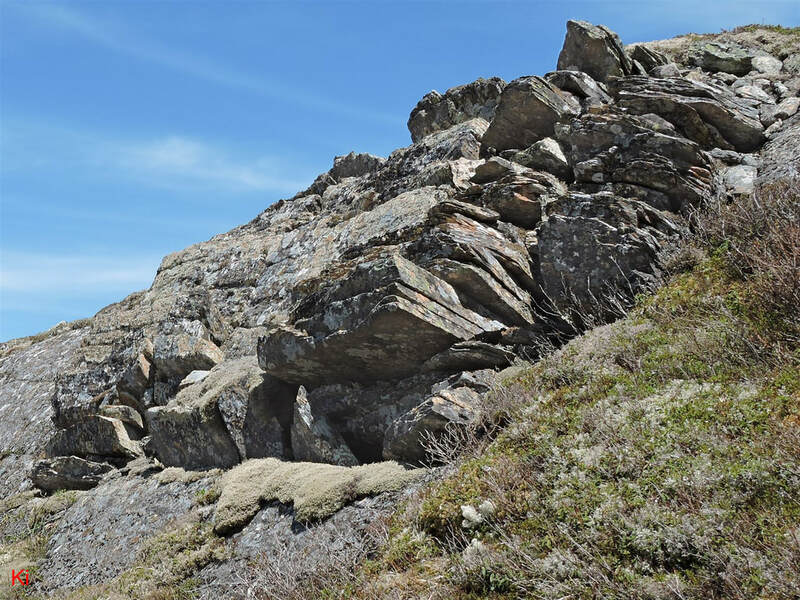 The two photos above illustrate the transition from frost-heaved bedrock monoliths at the top of the ridge to large rotated joint blocks on the sloping portion of the ridge. The photos below show the rotated joint blocks in more detail. The lower portion of the ridge resembles a possible occurrence of plucking by warm-based glacial ice. It is only the co-existence of cold-based glacial artifacts at the top of the ridge that warrants interpreting the joint-block rotation seen above as being a hybrid phenomenon incorporating both subglacial frost heave and the effects of cold-based glacial ice creep. 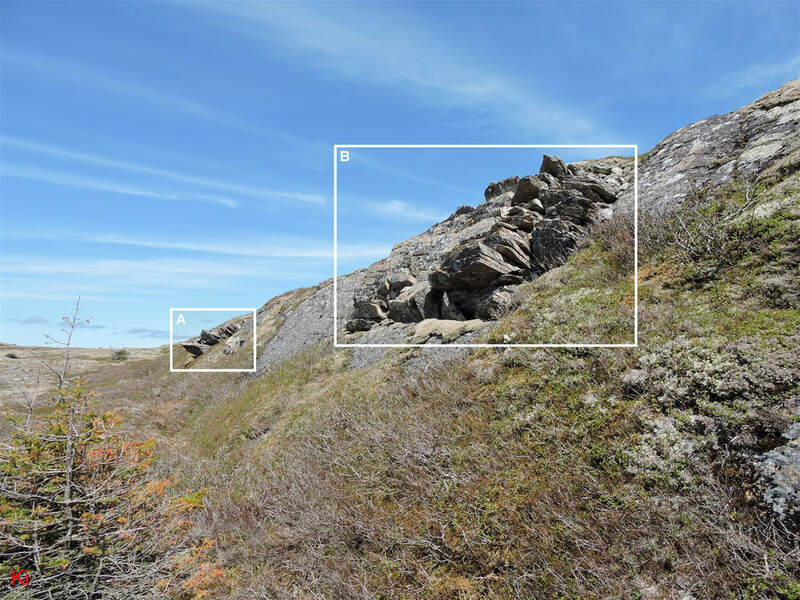 The above two photos show areas of apparent removal of rock from the ridge, Transitional feature 4, by glacial transport. A large corner section of the ridge has been carved out of the left end of the feature , as is seen in the first (left) photo above. The second (right) photo shows two left-facing (lee side) vertical surfaces (a smaller, hard to discern, surface near center of frame and a larger surface in center foreground). These surfaces reflect the dislodging of joint blocks and the down-ice transport of the removed blocks. 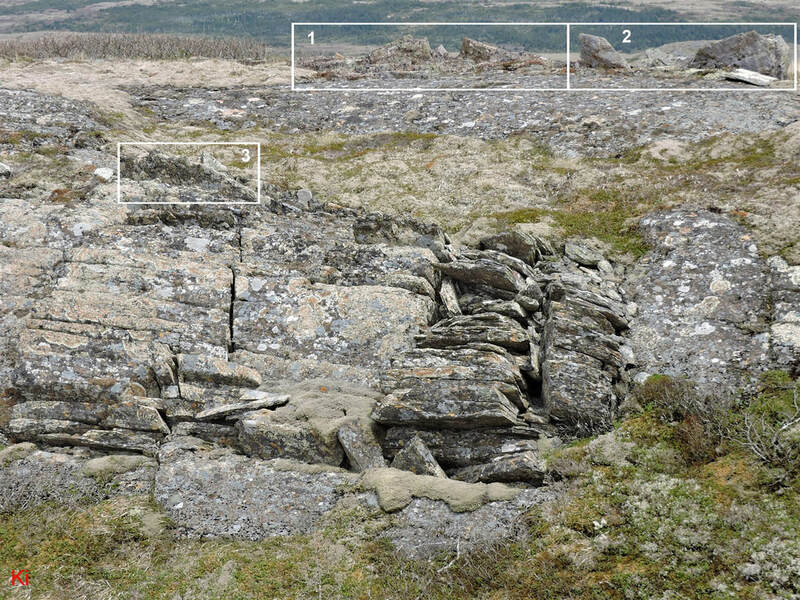 At least two of the joint blocks that were shifted from the smaller (center of second photo) vertical surface can be seen (hard to discern) lying flat on the sloping ground in both the second (right) photo above and the first (left) photo above. In summary, Transitional feature 4 shows evidence of plucking or mechanical separation and transport of joint blocks by probable warm-based glacial ice flow. A significant volume of rock from the corner of the ridge has been removed from the site entirely. The ridge also shows evidence of extensive vertical frost heave, indicative of the onset of subfreezing conditions. 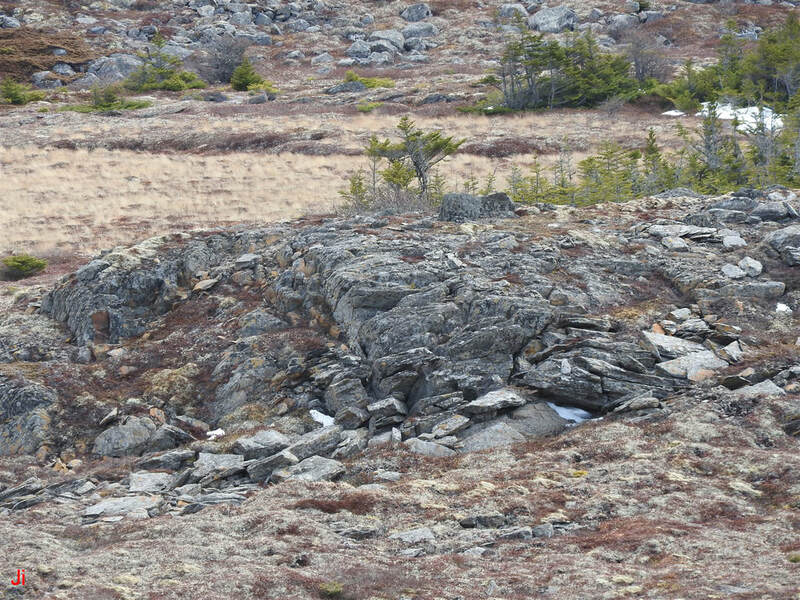 Some frost-heave features on the top of the ridge have been rotated systematically, indicating cold-based glacial ice creep across the site during or after vertical frost heave and in the same direction as the preceding warm-based glacial ice flow. 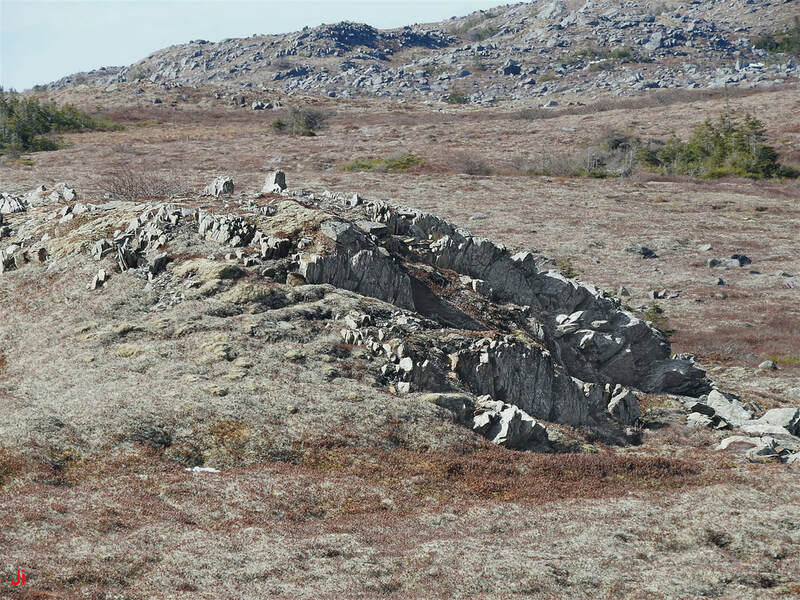 The large rotated joint-block feature on the lee side of the ridge was presumably formed in conjunction with the vertical frost-heave features on top of the ridge. If this presumption is correct, then the rotated joint block feature is a subglacial frost-heave feature augmented by tangential cold-based glacial ice creep. The above photo shows the landscape in the neighborhood of Transitional feature 5. The feature itself (see description below) is not visible in this preliminary picture. Transitional feature 5 lies on a long, low double-lobed ridge formed from strongly foliated regionally metamorphosed sedimentary rock. The ridge is streamlined and smoothed in every approach direction implying multiple episodes of warm-based glacial erosion with changing directions of ice flow. Prior to final deglaciation, the ridge was affected by frost heave. 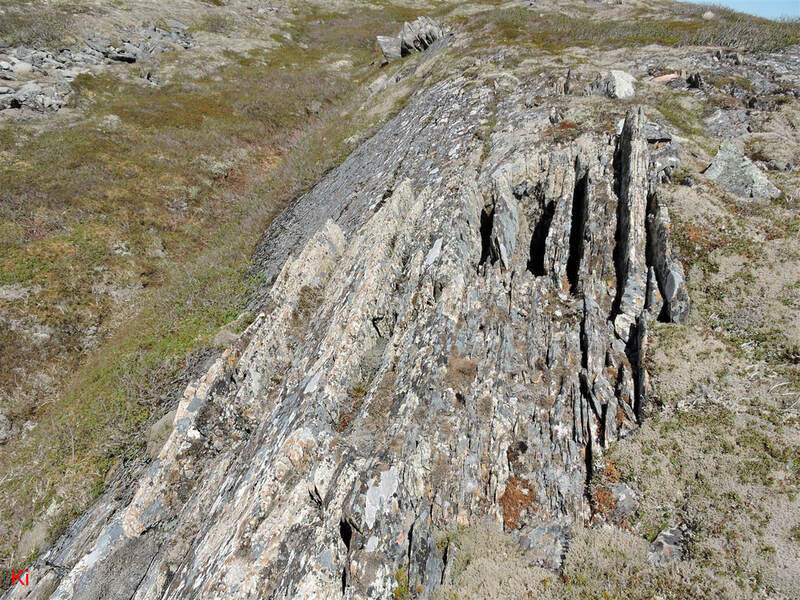 The frost heave event formed numerous occurrences of vertical bedrock frost heave, bedrock frost heave with rotation on level and sloping surfaces, and complex areas of ice-disrupted bedrock. A vertical bedrock frost heave feature is evident in the foreground of the landscape photo shown above. The vertically-shifted blocks grade over into bedrock frost heave with rotation at the edge of the top portion of the ridge. Other instances of vertical bedrock frost heave (example shown right) can be seen in the background. The above photo shows an instance of bedrock frost heave with rotation at the southwest end of the long, low ridge hosting Transitional feature 5. Ice flow direction at this location is clearly indicated by the direction of tilt of the frost-heave features. However, other indicated directions of ice flow at different locations along the ridge (ridge is more than 1 km long) are variable and inconsistent with the observations at the southwest end. Note that ice flow directions indicated by tilted frost-heave features are presumably directions of near-ground creep in an overlying cold-based glacier, and are not necessarily related to the flow directions of preceding warm-based glaciers moving in basal sliding mode. 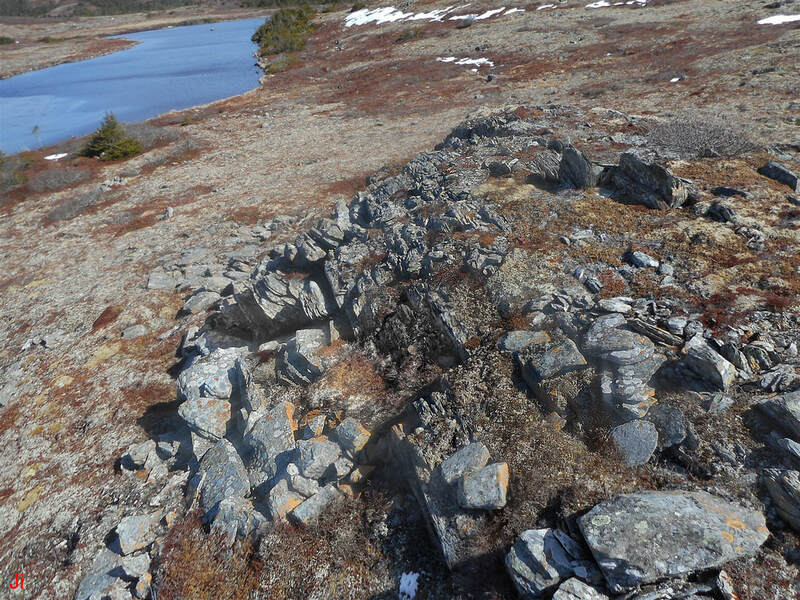 The above photo shows the inside edge of the double ridge, looking north from a location near the northeast end of the ridge. The photo shows three separate instances of frost-heaved bedrock. 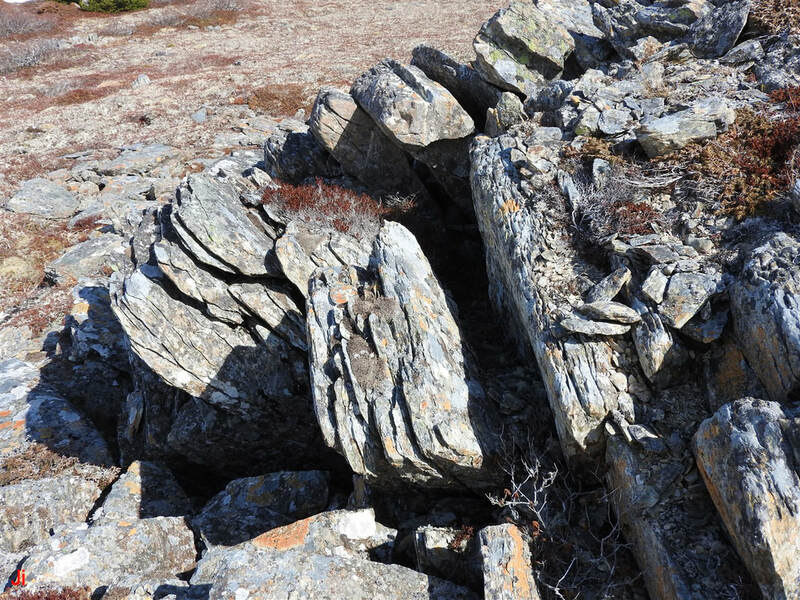 The instance furthest in the background is an example of bedrock frost heave with rotation, while frost-heaved blocks seen in the occurrence nearest to the camera show no rotation. The middle occurrence contains both rotated and unrotated blocks. The unrotated blocks follow the typical form of bedrock frost heave on a level surface, even though the surface is steeply sloping. 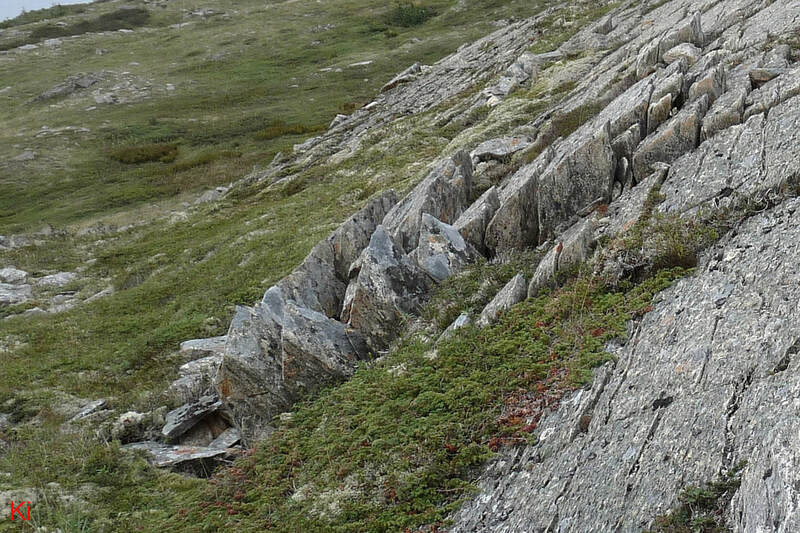 The foliation of the bedrock in the ridge dips approximately vertically. 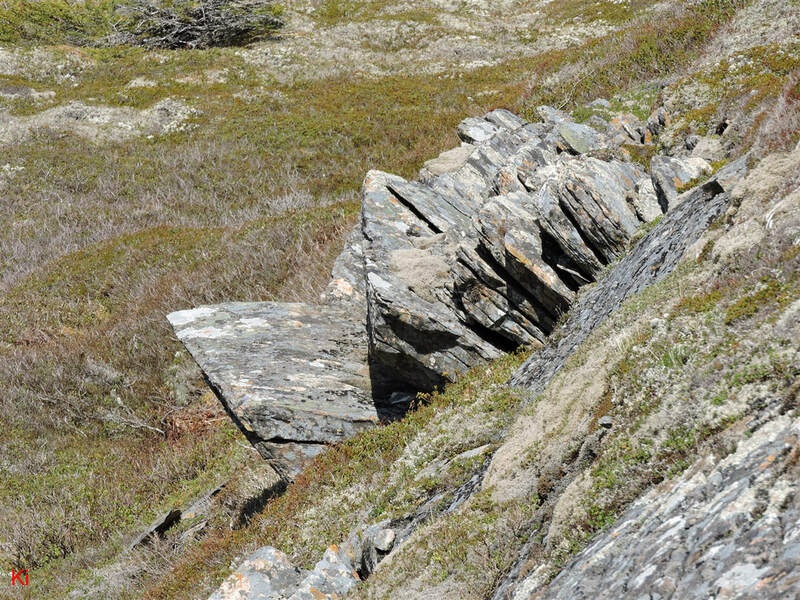 The displaced blocks seen in the frost heave occurrence at the upper right of the photo are not bounded by the plane of foliation on any side. Instead, the blocks are bounded entirely by cross joints. 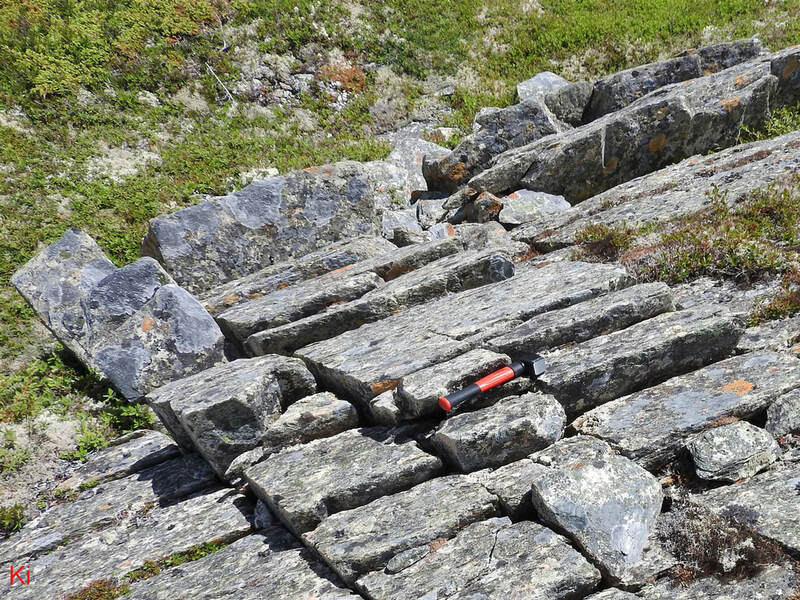 In contrast, the occurrences of bedrock frost heave with rotation are comprised of blocks bounded by the plane of foliation and by cross joints running orthogonal to the plane of foliation. It is not clear why the frost heave developed differently at the different locations. In the above photo, the two occurrences of bedrock frost heave with rotation mentioned previously are indexed to aid in further description. Occurrence "B" forms part of Transitional feature 5. Closeups of occurrence "A" are shown below. 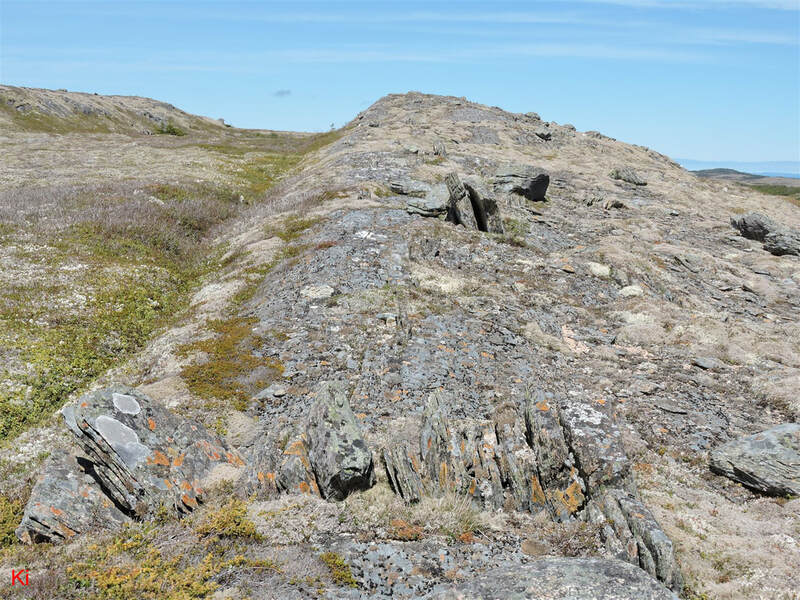 As seen in the above photos, occurrence "A" is an occurrence of bedrock frost heave with rotation where joint blocks were separated from bedrock along planes of foliation and then rotated through a substantial angle. The bottom blocks in the group were rotated by 90 degrees, while the overlying blocks were rotated by lesser amounts. The original glacially smoothed surface of the ridge remains visible on the rotated blocks. The lower portion of Transitional feature 5 is shown above. Most of the displaced joint blocks have been shifted outward from the sloping face of the ridge via rotation. Note, however, the blocks at the lower left corner of the feature. Some of these blocks are not rotated significantly and have been shifted mainly by translation in a direction normal to the sloping face of the ridge. Another view of the sloping portion of Transitional feature 5 is shown above. 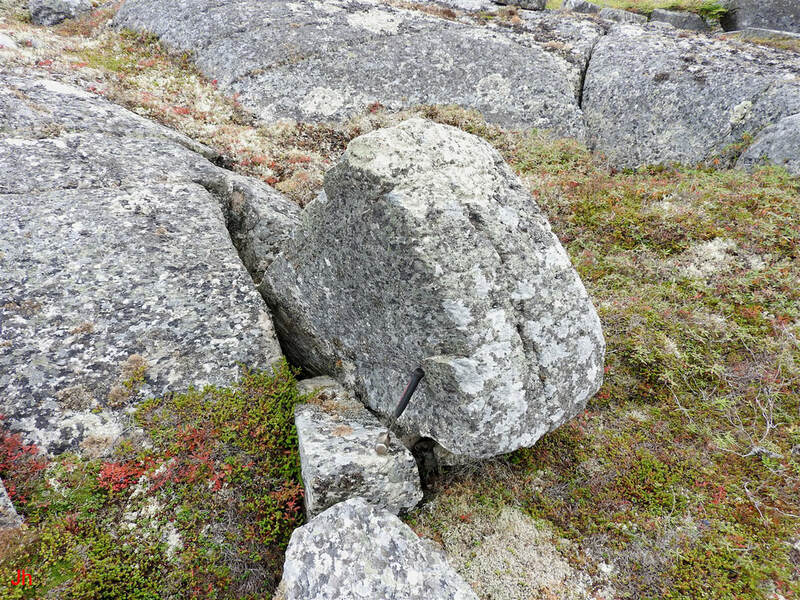 The hammer at the left rests against a block of vertically frost-heaved bedrock. This block is numbered "3" in the index photo below. Transitional feature 5 is shown above. 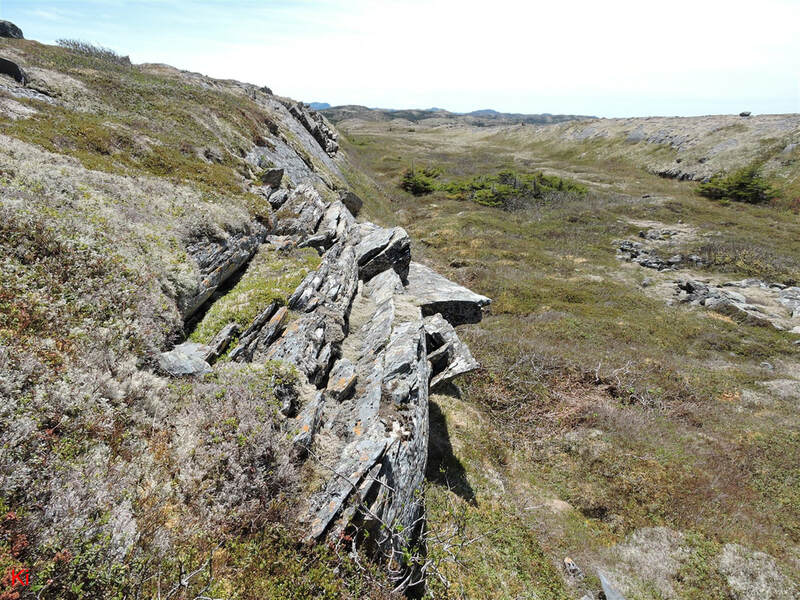 The feature comprises the ice-disrupted bedrock slope illustrated previously along with the three instances of vertically frost-heaved bedrock that are indexed in the above photo. The area of vertically frost-heaved bedrock designated "1" in the index photo appears in the center foreground of the above photo. The area designated "2" appears just to the right, in the background. The photo below shows the same two features viewed from the opposite direction. 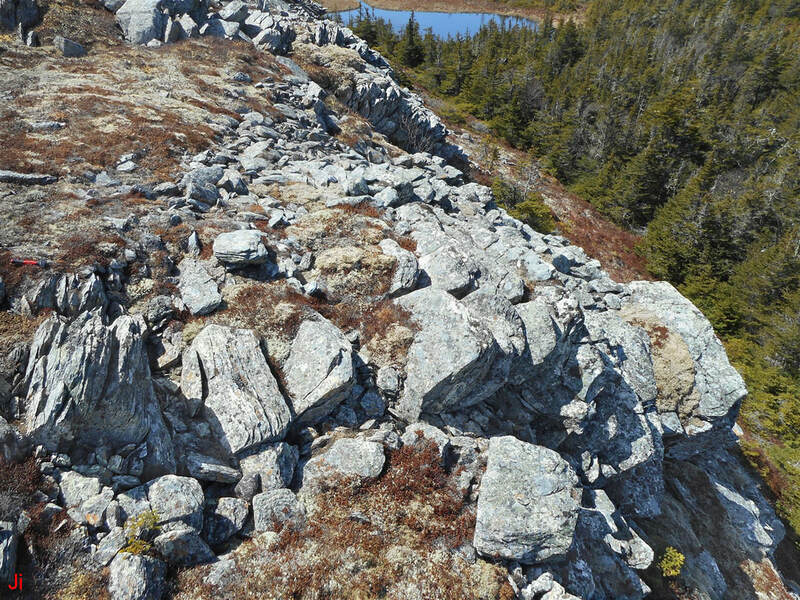 The two closely-spaced instances of frost-heaved bedrock shown in the above photos are examples of the widespread but generally low-relief ice-disrupted bedrock found on the top of the ridge. 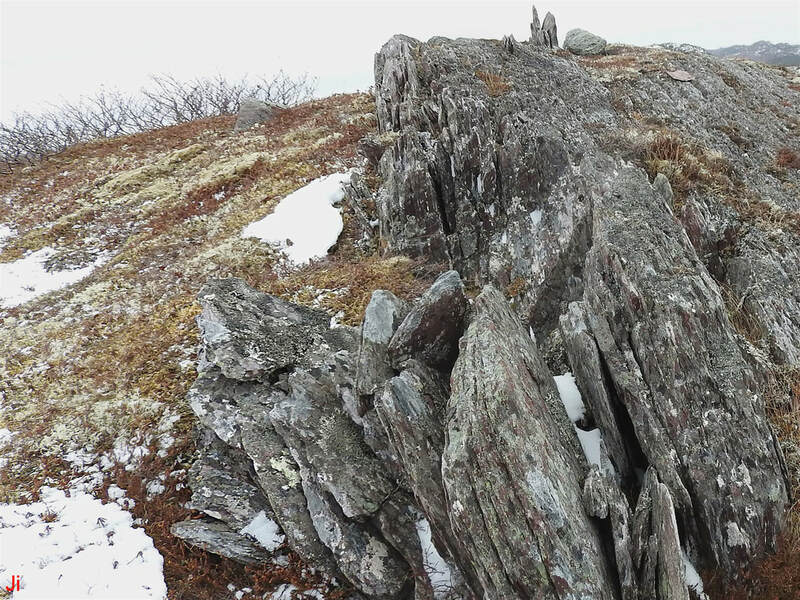 While these particular vertical frost-heave occurrences lie close to an area of bedrock frost heave with rotation on the side of the ridge, the proximity of the ridge-top features to the side features at this location is probably coincidental. 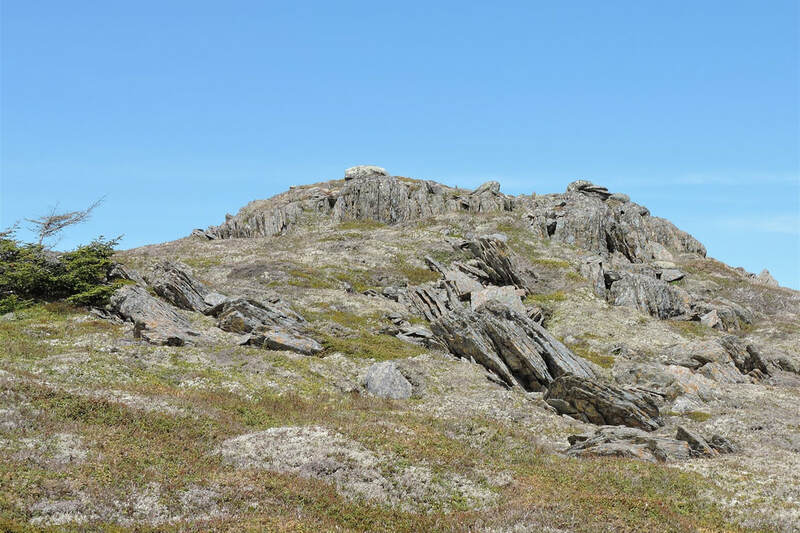 There are multiple instances of frost heaved bedrock on the top and on both sides of the ridge, with no obvious correlation between their positions. Nevertheless, it appears reasonable to attribute a common origin to all of the frost-heave occurrences observed. The vertically frost-heaved block numbered "3" on the index photo appears in an end-on view at the right-hand edge of the area of rotated frost-heaved bedrock shown above (Transitional feature 5). 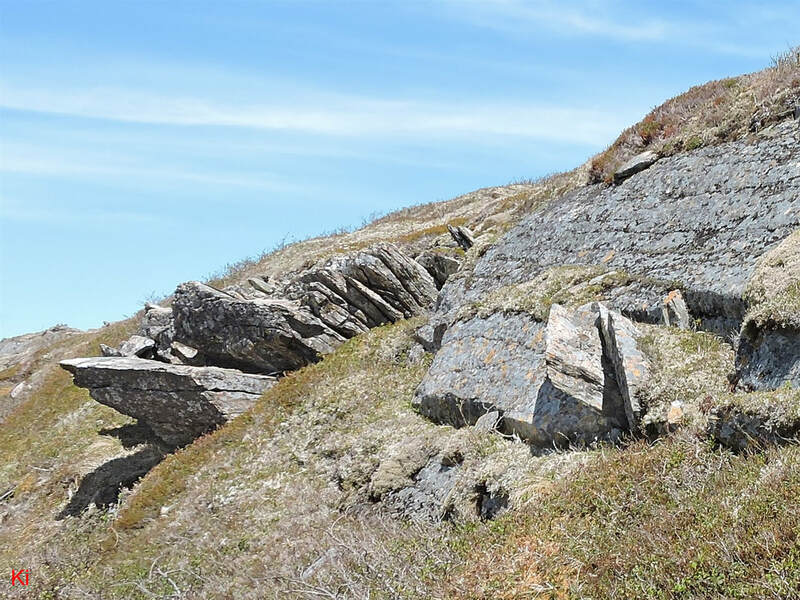 It is apparent that the zone of frost heave seen on the sloping side of the ridge (frost heave with rotation) starts out with vertically-translated frost-heaved blocks at the top edge of the slope. This suggests that the frost heave geometry at this site was guided by rock confinement rather than by tangential glacial ice flow. In summary, the ridge hosting Transitional feature 5 was affected by bedrock frost heave at several locations, with the frost heave occurring in different geometries, depending on the location and slope of the bedrock terrain. There is convincing evidence that the bedrock frost heave observed on the ridge was subglacial in origin. However, there is no clear evidence of tangential glacial ice creep occurring in a consistent direction over the ridge. Rather, the observed bedrock disruption seems to reflect non-tangential ice creep, driven by the generation of subsurface ice within the ridge. If this analysis is valid, the entire ridge represents an example of subglacial ice plume activity. This theme will be pursued in more detail in the discussion of Illustrative Feature 08 (pending).